This is one in a series of articles contributed by Heifer Sacramento volunteers reflecting on their experiences from visiting Heifer Ecuador projects in 2013. Ecuadorian artisanal fishermen cast nets with high hopes for sustaining their way of life. Heifer is supporting the development of collaboratives of fishermen and their families to encourage collective action along with fairness and equality of access for the resources they have traditionally depended on for food security and income. We learned of an ingenious approach whereby Heifer has provided seed money administered by the local Movimiento de Mujeres de El Oro, to support the empowerment and social inclusion of women in the community as full participants in the Artisanal Fishing Collaboratives. These women-- wives, mothers and daughters of the fishermen-- have chosen to use grant funds to provide low interest loans to fishermen within the organization to purchase needed equipment and supplies. Provision and repayment of these loans is a seen as a viable expression of the Heifer cornerstone value of passing on the gift. As loans are repaid, additional fishermen can access resources and new members can enter the collaborative and, in the long run, new collaboratives can be formed. The collective has also chosen to use funds to construct a pier and adjoining meeting facility. The overarching goal is to promote community organization and solidarity in working to achieve direct access to the market and fair prices for the catch with the eventual elimination of the middlemen. Objectives to reach this goal include fostering a collective voice to influence local government, holding commercial interests accountable to the letter of the law, and promoting the health of the fishery and mangrove forest. Our experience with the fishermen was definitely hands on; in fact it was 'all hands on deck.' The Heifer volunteers joined two-man crews on their small boats for a day of fishing. In between casting and placement of the 1,000 meter nets and hauling in the catch (given a bit of good luck), our crew, Hector and Umberto, told us about decreased catches, piracy, concern for the health of the mangroves with their importance to the ecosystem and expressed antipathy for the middlemen with colorful adjectives. In spite of these challenges, the men had high hopes from their participation in the collaborative. Celebrating the gift of life one fish at a time. Following our day of fishing, the community hosted a celebration complete with delicious food and dancing, which was preceded by formal expressions of gratitude and dedication to a vision for a brighter future. Marlena Flores, a primary organizer of this event, made an eloquent speech that touched me deeply. She said that before her involvement in the collaborative she was treated more like a maid rather than a wife and a woman with a say in her life, and that was how she saw herself. Now, after two years with the collaborative, she sees herself and is seen as a valued member of her family and community and knows that her efforts can make a difference in fostering and sustaining healthier, happier lives for all. Heifer Sacramento Goes to Ecuador! A group of 12 Northern California Heifer volunteers (7 from Heifer Sacramento) visited with Heifer staff and project partners in Ecuador during summer of 2013. This was an extraordinary opportunity to have first hand experience of Heifer’s work. The sounds, feel, taste, and interactions with those whose lives have benefited from Heifer’s work has inspired and invigorated each of the visiting volunteers. Over the next several months this blog will feature more stories about the experiences other volunteers had on the trip. So watch this space! Heifer has been active with development work in Ecuador since 1954. The trip was designed as an agroecology field study of Heifer’s community development work on behalf of small-scale rural farmers there. Agroecology is the sustainable use and management of natural resource, accomplished by using social, cultural, economic, political, and ecological methods that work together to achieve sustainable agriculture production. Heifer is working within an integrated system of plant and animal production practices to satisfy human food needs, enhance environmental quality and natural resources and make the most of on-farm and renewable resources. with banana and cacao farmers of the El Guabo Cooperative near Machala, Ecuador in 2013. The visiting Heifer volunteers cast nets with artisanal fisherman on the Ecuadorian coast, explored banana and cacao groves in the tropics, and learned about organic farming practices in a variety of highland locations. In small communities, enterprising local groups of men and women organized in cooperatives are maintaining and, in some cases, reintroducing indigenous food-production methods. They’ve incorporated a whole host of clean, organic, and sustainable farming practices, including using a modest numbers of livestock. They’ve integrated the concepts of companion planting of diverse crops, composting, using plants as ‘living fences’ to attract pollinators and beneficial insects, and seed saving to grow and harvest healthier, more attractive produce. The farmers that grow food using these methods, without synthetic fertilizers and pesticides, have found that it gives added value to their produce and products in the marketplace. Heifer International Ecuador employs a development model that values and preserves the contributions of small rural producers seeking to feed their families and maintain economic self-sufficiency. Farmers are encouraged to organize themselves and use Heifer’s resources for training, education and marketing. Heifer Sacramento volunteers were out in force at the 2013 California State Employee Charitable Campaign kicked off at the state capital on August 21. It was a beautiful sunny day for getting to know all the charitable organizations that California state employees can support with monthly deductions from their pay checks. It doesn't get easier to make a difference. No stamps. No reminder mail. Set it and forget it! Know that your pre-tax donation will help lift families out of poverty and into lives of self-reliance. How much does it take to help? Five dollars a month for 12-months is enough to donate a flock of chickens/geese/ducks, a trio of rabbits, trees, or 2 hives of honeybees. Ten dollars a month for 12-months makes it possible to donate a goat, pig, or sheep. Your donation is also magnified through Heifer's Passing on the Gift, where Heifer's participant commit to pass on the gift of an animal off-spring and training to another family in need. This is a self-sustaining gift. Heifer Sacramento have enthusiastic volunteers eager to staff booths or provide speakers for CSECC events. Contact us! Can't make a CSECC event and want to learn more of Heifer? Visit Heifer International's website for a wealth of information and a video library on Heifer's nearly 60 years work toward eliminating poverty and hunger. Donate now! Here's the CSECC donation form. Heifer International's CSECC code is 315. Read about how one state employee learned about how Heifer Int'l offers a hand up instead of a hand out and became an ardent supporter. Frank Losco talks about Heifer's work at the 2013 CSECC kick off. Walk on the Wildside (Stone Lakes National Wildlife Refuge) this year was not as busy as in previous years, but our volunteers still found it a worthwhile event to attend. Approximately 150 people stopped by and 80 kids participated in crafts at our table. A few people filled-out speaker requests forms, which John Brewer will follow-up. Day on theFarm (Soilborn Farms) was a more relaxed event this year than previous. Two volunteers per shift were sufficient to talk to everyone who came by. We had a good location near the entrance to the event. We premiered the new improved spinner at these events -- see item IX below. Heifer |Volunteers is a new site for Heifer volunteers. Per Jill, “the purpose of the website is to streamline access to information for Heifer volunteers into one place, as well as provide an electronic platform for collecting information on the work that our community volunteers are doing… In the future, this website will merge with Heifer's main database, and will become the main vehicle by which Heifer tracks the information and activities of our most valued and active community volunteers.” When Jill visits us next, we’ll take up this topic; meanwhile, it’s worth a visit to look around. Our group isfeatured there on Heifer's When Cows Fly. From a recent introductory email: “Have you checked out When Cows Fly yet? It’s an online portal where Heifer donors, volunteers and participants from around the world can share their stories. Like this fiber artist, who is using her talents to benefit others. Or Sarah Sow, who donated a gift to Heifer in honor of her mother, as well as her good friend Polly Pig’s mother. (You are curious about their names, aren’t you? Click through and find out!) Heifer Sacramento shared info about a Fun Raiser fundraiser they are holding, and a California church’s Bike-a-Thon. You can share your story, too." We wondered whether our efforts on the campaigns last fall paid off in increased pledges to Heifer. At this point, we aren't sure yet. We don’t have the data corresponding to that time period. However, the group consensus was to participate again this year starting with the kickoff events and then as requests come in, we'll refer to last year's note to decide which to attend. Kickoff events for the state and federal campaigns have been scheduled. Cheryl has requested that our group be put on the invitees list for the state kick off. California State Employees Charitable Campaign Kick-Off Event, August 21, 2013, 11 – 1, on the West Steps, State Capitol. IV Heifer Project Visit to Ecuador: Expectations? Requests? Those going on the week-long project visit in Ecuador will be taking photos and composing daily logs. On return these will be combined into presentations. Discussion suggested centering presentations around themes that the participants observe on their visit. We had a brief discussion on what those not going on the trip might want to learn. Questions: What do participants want to know about donors? What were the mechanics of establishing the various projects? Of course many more questions – and answers – will develop. This past spring we tried developing a fundraiser with the assistance of student event planners. Reasons for discontinuing the planning effort were discussed in previous meetings. Susan Rumberg confirmed that the relationship with the Sac State faculty contact remains good and both parties are open to working together in the future. Susan R. sees that it is important to document the lessons learned from the experience and will prepare guidelines to benefit future collaboration efforts over the summer. The fortunes of our group's fundraising effort, tallied at Team Heifer, have taken an upward turn. This includes an anonymous $1,000 donation with a match for Heifer Ecuador. Thank you to the anonymous benefactor!!! This reflects a matching gift and goes to Heifer Honduras. This goes to show what a talent show can accomplish! Huge thanks to the many contributors who've helped us reach nearly the halfway mark to our goal of $10,000. Volunteers, be sure to reach out and again thank those friends and neighbors who have donated. Laurie Heller is working to enter Heifer’s film Twelve Stones into the 2014 Wild & Scenic Film Festival held in Nevada City organized by the South Yuba River Citizens League. The 2014 festival is scheduled for Jan 10 – 12. Great idea, Laurie! We hope the effort succeeds. Discussion took place on the fit between Heifer themes and the Waldorf curriculum. John Brewer has a contact with the Waldorf system that he may pursue. The group also discussed a brochure used in the past for elementary classroom visits. There was consensus to produce a new edition; John and Susan Sundell will prepare copy and Cheryl will update the design. The group will check the list of Heifer materials to see if such a new version already exists. Volunteer hours via Google docs – Our time reporting system seems to be working well. John notes that a lead volunteer for any given event can input hours for everyone who participated. Nicholas Kristoff, author of Half the Sky, which included a large section on Heifer’s work in Africa, will be speaking at the Mondavi on Jan 13, 2014. New Spinner – The new lighter portable spinner is great and easy to transport! Cheryl prepared graphics for each slot with numbers 1 thru 12, the cornerstones, and twelve Heifer project animals. These graphics should make the spinner easy to use and applicable in most circumstances. The graphics can be changed, as needed. Big thanks to Jill for underwriting it! Susan Rumberg brought a box of Heifer swag, which was intended for Casino Night to add to the group's supply. Food is on many of our minds. How it's grown. How to make it. Where to eat it. But don't forget what happens to it after you're done. Today is World Environment Day, as established by the United Nations Environment Programme. This year's theme is Eat.Think.Save, emphasizing reducing both food waste and food loss. Each year 1.3 billion tons of food is wasted in the world. In the U.S., 30% of all food is thrown away each year. All the wasted food can certainly feed a lot of people. Wasting the raw resources used to produce the food is bad for the environment and for out growing population. We need to think about ways each of us can help to stem food waste and loss. Read more discussions and see a video on food waste at Heifer International. Here's a piece on food waste ties with water waste from NPR. Out of the 1.3 billion tons of food wasted worldwide, 45 trillion gallons of water is wasted. That's a LOT of water. Another reason to watch what we waste. Heifer Sacramento joined in celebration of all things wild at Walk on the Wild Side outdoor festival held at the Beach Lakes Preserve near Freeport to learn about wildlife and conservation. Our volunteers were busy helping kids make bee bracelets, talking about how wildlife works with agriculture and how Heifer helps people in poverty. Darrian spins for a prize for answering what a heifer could produce to help a village. Sacramento Earth Day – This was a successful and well-attended event held at Southside Park. Volunteers were kept busy talking to interested participants about Heifer’s work, making bunny puppets with children and manning the ever-popular Heifer spinner. Midrasha Jewish School – Susan Sundell reported on her presentation to teens interested in community service activities. The 14 children attending were familiar with Heifer’s work and the World Ark magazine. It was suggested that a follow up email be sent to the group leader to offer our support and fundraiser ideas to encourage the teens to get more deeply involved with Heifer. Renaissance at CSUS - JoAnn shared 2 Heifer videos with her Spanish group (Seeds of Change and a video on youtube about bringing back traditional food in Bolivia). Both videos, done in Spanish, were so well received that several members of her group made contributions to Heifer. The Fun Raiser of March 29 was featured on the national Heifer website When Cows Fly. Woohoo -- we're famous! John suggested that we have a point person for each of the spring events for next year…one person in charge of making contact and handling the details of registering and signing up volunteers for each event. https:volunteer.heifer.org – This new site comes from headquarters. It invites people to volunteer in their communities and to fill out Activity Reports. More information to come about using this site as we learn more about it. State/Federal Employee Charitable Giving Campaign – Laurie Heller will talk with Jill Kilty-Newburn about any data received from the work we did last fall on several events we supported with talks and tabling. This fall we may just go to the kick-off event on the steps of the state capital and partner with Jim Hill from Global Impact to support any event requests he receives. Spinner – Jill has purchased a new, lighter spinner to replace our attractive but very heavy spinner to take to events. Cheryl will be working on some graphics to go in each of the 12 slots. We’ll keep it simple and try to make it useful for most situations. Two for one. Who doesn't like that? Generous donors and international partners have offered to cover half of new project costs in Honduras and Guatemala through matching donations. This is a great opportunity to help poor families in these central American countries lift themselves out of poverty and build resilient communities. We need to generate $831,000 from generous donors like you. Two for one. We don't want to leave any of the match on the table! Donate to these projects now. Heifer's work in Honduras has already helped families broaden their source of income through the gifts of diary cows and chickens and the extensive training. These projects have already achieve successes through multiple Passing on the Gift ceremonies, where initial recipients pass on the next generation of livestock to others in their community. These gifts have also made the families more resilient. When a drought in 2012 destroyed the corn harvest, milk income from a Heifer cow helped supplement income from existing cashew harvests. Heifer Guatemala has helped improve the nutrition and food security for poor families through the gifts of chickens and goats. These livestock provide valuable protein that the families would otherwise ill afford on a regular basis. The extensive training and participant committment to the 12 Cornerstones have built communities among families in remote rural areas. Read more about Honduras projects and Guatemala projects. Donate now and do twice the good for families in Guatemala and Honduras. The fundraiser sub-committee and CSUS students Kelly Cassidy and Anne-Marie Jara, reported on the status of event research/planning, which is planned tentatively for a weeknight in April. The students report success in previous years with putting on a Casino Night to reach young people. The event would include food and alcohol sales and offer donated prizes. The sub-committee is finding difficulty with settling on a suitable location with the least cost while remaining proximal to the CSUS campus. They have several ongoing discussions waiting for additional information. We will know more soon. The musical FUN-raiser is set for Friday, March 29 from 7 pm to 9 pm at Arcade Public Library, 2443 Marconi Ave, Sacramento. John Brewer is organizing musical friends who will invite supporters for both their performances and for Heifer. A special page on Team Heifer has been set up to accept online donations. Based on previous experience with spring Earth Day events, we have identified those that most worthwhile and beneficial for our group to attend. The list of Earth Day events we plan on attending follows. Teresa & Cheryl report that previously identified bugs have been worked out and donations are crediting correctly to the Sacramento Heifer Volunteers -- $1,416.77 has been generated towards our goal of $10,000. See the Heifer Sacramento Volunteers team page. The Nevada County Beekeepers has requested a “bee-specific” program from our group. JoAnn Peter and Cheryl McKinney will make a presentation to them when the date is set. Cheryl is in the process of researching on the topic of bees in Heifer’s work and with Jill’s help has heard from some area directors with information. Jo Ann will speak about her visit to a Heifer Honduras project that included bees. A Girl Scout leader invited us to speak at this year’s World Thinking Day (February 22, 2013). Unfortunately, wires got crossed and we didn’t make the connection to allow us to participate this year. We’ll make a note to start contact earlier next year. She is still interest in have us speak about Heifer and offered to have us make a presentation at a monthly leaders’ meeting on what Heifer can offer troops. Pat Sayer-Handley will carry forward with this lead. Many donors and those we speak with about Heifer’s work are interested in what Heifer is doing about hunger here at home in the community. Heifer’s only current domestic project is Seeds of Change located in Appalachia and in the Arkansas Delta regions. Jill described that the initiative is only in the first year of a five-year process, even though we have been aware of the initiative for some time. We discussed the new film “A Place at the Table”. More information and a trailer is available throught the link. On Friday, March 1, Magnolia Pictures released the movie documentary on American hunger titled "A Place at the Table" by Kristi Jacobson and Lori Silverbush. The movie drives home several important points. 1) There is enough healthy food for every American. 2) With the increasing poverty in our country as a result of the ongoing recession and other reasons, over 50 million Americans (one in four children) receive some form of government or charitable food assistance. 3) This generation will live sicker and die younger than their parent's generation. 4) Cheap, processed food is the only option for many Americans and the result is poor diet, chronic disease (diabetes, obesity, etc.) and rising health care costs. 5) Faith-based groups are working hard to provide adequate food for all adults and children, but they cannot meet all of the needs. If churches could solve the problem, they would have done it by now. 6) This is a question of patriotism. If another country was doing this to our kids, we would be at war. The movie is available on i-Tunes, cable and satellite on-demand and in selected theaters. A sub-committee for fundraising events will meet with CSUS students Kelly and Anne-Marie on Monday, February 11 at Shine on 14th and E streets. The group will discuss ideas for fundraising and refine specifics for a spring event. Suggested ideas for fundraising events are bike-a-thon, hiking event, walk/run event, pig roast, yoga-thon, evening of drumming, beggars banquet, musical events, crab feed, etc. Kelly and Anne-Marie will bring along some previous fundraising ideas for consideration. The spring event should be completed by May 15th to accommodate the student’s school schedule. Volunteers on the sub-committee are Linda Eisenman, Pat Sayer-Handley, Susan Rumberg, Frank Losco, Judy Grimshaw; Laurie Heller will also assist. Teresa Fung answered questions and demonstrated using the Heifer Sacramento Volunteers site on Team Heifer for recording our fundraising progress as a team. Donations can be made with a credit card, or a check can be mailed in with an off-line donation form printed from the site. Donations can be made to specific Heifer Sacramento Volunteers' events. Suzanne Awalt, lead volunteer, reported that Jill Kilty-Newburn, leader of our local-group Study Tour, will be at the March volunteers meeting. Volunteers interested in going on the trip to Ecuador will meet with her at 5pm that evening for information about the itinerary, types of projects and other trip details. An application form and request for a deposit will probably happen in late February and reservations are on a first come, first served basis. A minimum of 7 and maximum of 10 volunteers will be necessary. Emily Shifflett, a student at UC Davis, with a long history of supporting Heifer’s mission, is working to establish a Heifer presence on the campus. She is working on obtaining official club acknowledgement on campus. The current group has about 10 members. Susan Rumberg offered to help deliver Heifer materials to Emily, when needed. Our group offered to Emily to call on our group to assist with presentations or support for any events for her group. Welcome, Emily! A light dinner and a Planned Giving seminar will be presented by Ardyth Neill, President of Heifer Foundation, at Campus Commons Clubhouse. Invitations will go out to Heifer supporters in the area, and any of the volunteer group is also welcome. Susan Sundell and JoAnn Peter have volunteered to find a caterer for the dinner; Cheryl McKinney will assist in setup. John Brewer – lead volunteer. John has organized 10 musicians and ensembles that have committed to perform at a fundraiser for Heifer International. Each musician/ensemble have also committed to invite 3 to 5 guests interested in enjoying an evening of entertainment and information about the work of Heifer, as well as supporting Heifer with monetary donations. RSVPs will be necessary. Suellen Rowlison is a delegate and will set up and partly staff a Heifer table. Others are welcome to participate: best days for volunteers would be June 20 & 21 (Thursday and Friday). Heifer has a presence at this market in Chico. Cheryl will email a spreadsheet of our usual events with dates and times. We ask that lead volunteers sign up and begin the application process. Please remember to record your volunteer hours each month on Google docs for the sake of time saving efficiency. Regular reporting of time spent on Heifer activities during the month insures you won’t forget to report all that you have done. Hard copies of the 2012 Annual Report are now available. Send your request to Susan Sundell, if you would like an annual report and didn’t receive one at the meeting. The report is also online at the Heifer web site. When Cows Fly is a new Heifer site for sharing info and stories about Heifer International. Check it out. Suzanne Awalt reported that on February 2nd the K-7 children put on a fundraiser for Heifer after being inspired by a talk by volunteer, Don Rake. They sold baked goods and used books, toys and crafts at a Heifer table at 28th and F Street to meet their fundraising goal. Need some sweet ideas for Valentine’s Day? 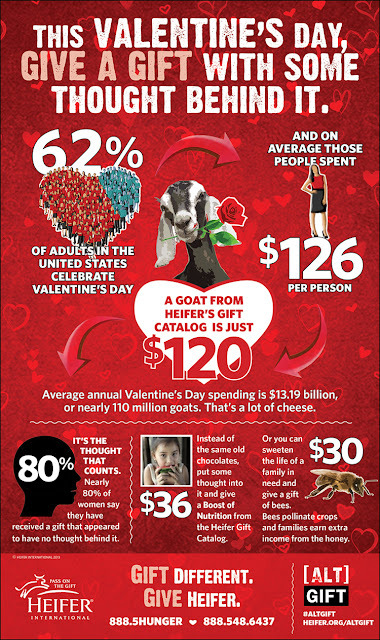 Think outside of the heart-shaped box and give a Heifer gift! How about some sweet bees that generate income and pollinate crops instead of the empty calories from candies? How about some sweet rabbits or chicks that provide nutrition and start a business for a poor family? Give hope, self-reliance, and nutrition and show your thoughtfulness to your valentine. Check out Heifer’s free Valentine’s Day printables. A group of homeschool students in Sacramento plans to hold a fundraiser this Saturday for Heifer International. The group of students range in ages from 7 to 9 years old has done all the work, from planning and goal setting, to make this fundraiser a reality. They are learning the elements to put an event together, while fulfilling their desire to help others. They will have a range of items and treats for sale at their Marketplace. All proceeds from the sale will benefit Heifer International. So stop by this weekend and encourage these young entrepreneurs and philanthropists!! * Free coffee with purchase/donation of $5 or more! Thank you Wondertree students for supporting Heifer International! Heifer volunteers have started staffing an information booth at the Certified Farmers' Market in downtown Chico. The Heifer booth will be at the market (near the corner of 3rd and Flume Streets) on the 3rd Saturday of each month from 8:00 am to 1:00 pm. Heifer volunteers will be on hand to share information about Heifer's work and ways to donate to help impoverished families move out of poverty and become self reliant through the gift of livestock and training. We need volunteers for the 2-hour shifts staffing the booth one Saturday each month. If you're interested, please contact Suellen Rowlison. We look forward to seeing you at the market! Musical Fundraiser – Wednesday, March 20, 2013, from 7:00 pm to 9:00 pm, tentative location Shine Coffeehouse (14th and E Street). John Brewer has invited several musical artists to participate in this event. Each musician has committed to bring their group along with 3 to 5 guests interested in enjoying an evening of entertainment and information about Heifer’s work, as well as supporting Heifer with monetary donations. Cheryl McKinney and Judy Grimshaw will make donation envelopes for contributions. We’ll show an updated version of Everyday Heroes in segments between performances. We’ll have the use of the stage and sound equipment at Shine in exchange for purchases made that evening and there will be no cover charge. John will meet with the manager of Shine to work out more of the details. Event Planning with CSUS students – John will continue to reach Beth Erickson, professor at CSUS. We are waiting for her response regarding our wish to be included on the list of organizations her students may want to partner with during the spring semester. They will be helping to plan events as part of their senior project. Vintage Faire – Pat will continue discussions with Alan Kline of Vintage Faire, a light rock and blues band, about a fund raising event at Shine in the near future. The group can be seen at The Lido Bar and Grill on Fair Oaks Blvd. near Manzanita on the first Saturday of each month at 7:00 pm. JoAnn reported that in 2012 a total of $1,300 has been donated to Heifer from the sale of Nifty Knitter items. Over the last 4 years, donations from sales have totaled more than $4,000. Heifer Headquarters in Little Rock, Arkansas sent our knitting group a certificate of appreciation that JoAnn Peter will send on to Marilyn Jorgensen in Eugene, Oregon. Marilyn originated the idea for Nifty Knitters and JoAnn, with the help of Heifer volunteers, has kept it going. Our thanks go out to Sue Bennett, who took donations at her church’s alternative gift fair in December for many of the knitted items. Volunteers will be sending out letters based on a template letter drafted by John Brewer to local churches that are currently supporting Heifer’s work. The letter thanks the churches for their support and request the name of a contact person that is interested in being their connection to Heifer Sacramento. Our own contact information will be included in the letter. The church is invited to call on us for speaker requests, literature or anything else we can do to assist their continued support. JoAnn Peter recently made personal contact with 2 local churches, Fremont Presbyterian and Trinity Methodist, and offered to be part of their alternative gift fairs this fall. The Team Heifer site is being revamped at headquarters. Cheryl McKinney and Teresa Fung have been in communication with HQ to make the site user friendly and reliable. Donations can be made with a credit card or a check can be mailed in with a form printed from the site at teamheifer.heifer,org/HeiferSacramentoVolunteers. More information will be available at the February meeting. Information is coming from Jill Kilty-Newburn regarding the results of our work last fall with Global Impact and CSECC (California State Employee Charitable Campaign) events in our area. A spreadsheet for the purpose of comparison should be available at the end of 2013. Results from 2012 were made available to Heifer volunteers in an attachment from Jill. When the 2013 results are in we should be able to determine our effectiveness at tabling and speaking for charitable campaign events. Annual Report – The 2012 annual report is still in printing. Susan Sundell ordered 15 copies for our group, when it is ready. The report is currently available online at the Heifer web site. Per Jill, one thing to note in this report that is different from the report from the last two years is that Heifer’s theory of change is outlined in this version. The canvas cover for the tri-fold is in need of repair. Pat Sayer-Handley will ask for help or advice from a sail making acquaintance, who might be able to advise us or willing to repair it for us. Please document your volunteer hours each month on Google docs. Remember to include hours spent at the Heifer book club or for Nifty Knitters. This year’s University of California Global Health Institute Conference is scheduled for next month at UC Riverside. We participated last year and found it a useful context for Heifer outreach. Hopefully the conference will return to northern California at UC Berkeley next year. Monday, February 4, 2013, Campus Commons Board Room 6:00 pm.